In this awkward love-triangle between two step- siblings, -Otome and Minami- and a best friend, Amane, the three are trapped in a web of love. After getting along for five years, Otome and Minami's peaceful relationship takes a turn in the wrong direction when Amane confesses his love to Otome. What will Otome do? 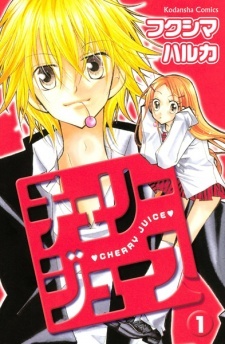 Cherry Juice was published in English by TokyoPop since September 11, 2007 to August 12, 2008. And I never wrote a review on this... why? I have no idea! What's wrong with me? I love Haruka Fukushima! Anyways. I own all four of these volumes and love them to bits! For starters, Cherry Juice&rsquo; story isn&rsquo;t exactly original (coughMarmaladeBoycough) nor is it generally crowd pleasing. But if you&rsquo;re in search of a sweet shoujo romantic comedy with touches of drama, then this will sure to satisfy you. The story begins with Minami and Otome, two adolescents that have happened to begin living with eachother under their parents circumstances. Five years ago, they were made step siblings. However, after Otome and Amane (who just happens to be Minami&rsquo;s best friend) begin going out. Does jealousy and sexual tension ensue? Why, yes! Yes, it does. The step siblings cling to each other while slowly realizing how they really feel about other people and their relationship itself. So as you can see, the story had some nice potential. And Miss Fukushima didn&rsquo;t proceed to let me down. The story is sweet, with poignant moments that don&rsquo;t make me gag. The whole taboo forbidden relationship concept brings apprehension, though the story is a bit fast paced. I would have liked for a bit more depth in some of the characters, like Otome&rsquo;s friends. Or Imai, who appears all of a sudden and you don&rsquo;t really get time to adjust to his part in the story. But Imai comes later so I shall not spoil anything. The characters are likeable enough. Though for some reason, main main characters of shoujo manga tend to annoy me. I&rsquo;m not quite sure why that is. Unfortunately it&rsquo;s not much of an exception for Otome. Her friends are interesting and somewhat unique though (well, not really unique, but interesting to say the least). Otome&rsquo;s friends are Naru with her cool and unphased personality and boy-crazy, fun-loving Aiko. The art is flawed, as Haruka Fukushima&rsquo;s always is, but I enjoy it anyway. It has a unique look that I could always recognize, and it is very pretty and pleasing to look it. She is one of my favorite manga artists for these reasons. Cherry Juice is not amazing, but I love it. It&rsquo;s lighthearted, but can be serious when it wants to. Give it a try if you want a nice high school romance. I don't see why people enjoyed this manga. It wasn't that good. Its kind of like... This manga... Had a nice start. You know the manga thats so gay and corny but you find yourself reading and buying the next one anyway. Yeah, thats this manga. There is no good reason, I see anyone else to waste there time and money on this. Otome and Minami have been step siblings for the past few years, so what happens when their relationship starts to develop into something more? This is a shoujo manga centred around the romance between a step-brother and sister. It’s very fluffy with a love triangle that you can find in a lot of high school romance manga. The story progresses at a good rate and is told concisely, due to it being not so complicated, which is good because there are numerous titles out there that try too hard to drag out a storyline with unnecessary plot twists or repetitive scenarios. There’s tinges of drama, jealousy and longing that aren’t too over the top to the point of being dramatic. Although it’s not very original, it is good for what it is and who it is aimed at. The art is in a typical shoujo style with no major flaws. There are a few mistakes here and there, but I feel they are awkward at worst and aren’t that noticeable unless you’re really looking for them. I have read other works by Fukushima Haruka and I like that you are able to recognise her art style, though it is imperfect. I don’t believe the art is bad enough to hinder your enjoyment, it’s cute and does it’s job in the execution of a lighthearted, high school romance. The main characters are really stereotypical for the genre they are in. Otome, our female protagonist; is the generic, confused (almost annoyingly), kinda boyish girl, who is quick to blush (and to anger). Her romantic interests, Minami and Amane, are also stereotypes with former being the playful type who is popular with girls, and the latter being the cool and collected glasses boy. It’s a shame that the other characters weren’t fleshed out as much as it would have given the plot more depth. What I do like is that the relationships between them aren’t as toxic or sexist as the one’s I have seen in other manga. Obviously these types of connections are seen in real life, but when they are glorified and portrayed as an ideal relationship IT REALLY AGGRAVATES ME. I find the sweet moments to be nicely refreshing. Even though the two main characters drag others into their situation, it’s purely because they are confused kids and not because they’re thinking of directly hurting anyone. As I said before, the sweetness of this type of manga is refreshing for me to read - especially in between other manga of darker, heavier themes. It’s simple and easy to follow, which leads to easy enjoyment and consumption. This whole manga is VERY cliche and most of scenes in it can be found in similar manga of its kind. However, I didn’t read it because I felt it would have a particularly original or interesting story, I read it because I was looking for something cute and heartwarming and this manga was just that. Should You Read: If you love manga related to shoujo, high school, romance, love triangles or the taboo of falling in love with a family member then I suggest you read this.